You like most other WooCommerce store owners lack deep insights and KPI’s needed to grow your business. But now with Putler, a complete WooCommerce reporting and analytics solution, it won’t be a problem anymore. Why in-depth reporting for WooCommerce is a must for your store? The standalone WooCommerce reports are good. But they only provide you with your store’s overview. You don’t really get any actionable insights about your products, orders or customers. And you may agree that this overview metrics can’t help you grow your business. Inorder to have a thriving business, you need to look at the bigger picture. You need to have your hands on in-depth reporting on every aspect of your WooComerce store. And that’s exactly what Putler provides! In-depth, advanced WooCommerce store metrics and reports! WooCommerce is the most popular WordPress eCommerce solution that helps you sell anything – beautifully. WooCommerce transforms your WordPress website into a thorough-bred eCommerce store for free. Delivering enterprise-level quality & features. Free, 100% Open Source – Allows you to benefit from an active and growing community of contributors, developers and designers. WordPress + Ecommerce – WooCommerce runs on top of WordPress – the largest CMS platform. You get all the benefits of WordPress, and a comprehensive shopping cart system as well. Big Marketplace – Thousands of free and paid themes, woocommerce plugins, woocommerce extensions that makes WooCommerce the most flexible ecommerce solution. Everything from setting up the store, to store management, inventory, shipping, taxes, marketing, SEO is covered. WooCommerce built-in analytics & reporting includes some basic reporting and analysis about orders, products and customers. You can filter reports by date ranges and can look-up individual product performance as well. But it’s not a complete reporting solution. The traditional WooCommerce reports give you an overview regarding your orders, customers and stock. These reports are simple and just an overview of your store’s performance. 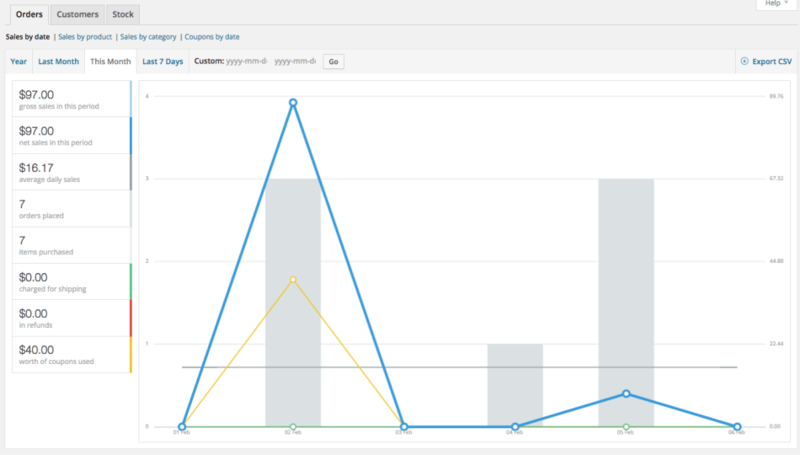 All these reports can be viewed for a custom date range as well. Stock reports list items that are low in stock or out of stock items as well as the actual quantity left in stock. 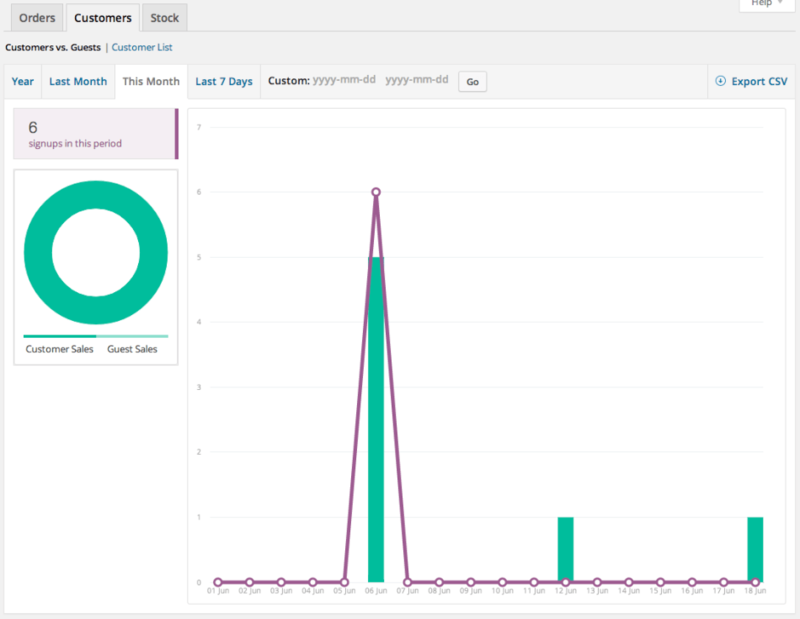 Awesome but…here’s what WooCommerce reporting lacks! WooCommerce reporting fails to bring up transactions and other sales related metrics. Transaction status – shopping cart, subscription, transfer, currency conversion and others, time when maximum and minimum sales occur,recent transactions quick list, revenue comparison, etc. For a better email marketing approach, you need complete customer details – name, email, social details, etc. as well as understand their shopping behaviour – who purchased what, when and how much. Moreover, you need to identify your best and worst customers, loyal customers etc. which WooCommerce reports doesn’t show you. Apart from best sellers, WooCommerce reports doesn’t provides any insights as to how each product is performing, their ups and downs, their contribution to revenue, slowest moving product, product in trend, frequently bought together and a lot more. Since WooCommerce core reporting capabilities are limited, many companies offer comprehensive reporting extensions for WooCommerce. Some of the popular ones include Kissmetrics, Mixpanel, Metrilo, Putler etc. Is Putler the best WooCommerce reporting and analytics tool? 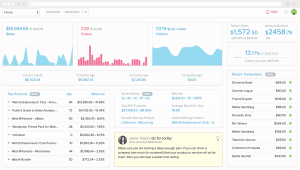 Putler in addition to basic reporting and sales analytics also has many unique features which you won’t find in WooCommerce. Consolidation: Accurately combine multiple WooCommerce accounts, payment gateways, shopping carts, currencies and even Google Analytics in a single dashboard. Automatic deduping: Combining multiple accounts leads to duplication of data that yields error in results. But Putler takes care of that and provides only accurate data. No switch over to multiple accounts: Unlike WooCommerce where you need to see individual data and add data manually from each account for total value, Putler provides all data at one place combined. No need of paid extensions: Putler’s strong and in-depth reporting gives all the necessary data you need at one place. But with WooCommerce reports, you need different paid extensions to enhance your reports which turns out to be more costly. Multiple currency support: Dollars, Euros, Yens, Rupees… Putler supports & automatically converts currencies to give you a global, single currency dashboard. WooCommerce doesn’t support multiple currencies. WooCommerce subscriptions reports & analytics: Putler provides subscription reports for your WooCommerce store. Metrics like Monthly Recurring Revenue (MRR), Churn rate, Customer Lifetime Value (LTV), etc. every subscription business must watch out for. Intuitive search: Putler’s search tool works at a blazing speed. Look out for your desired transactions, products or customer in seconds. Deep growth insights: Get expert advice and intelligent recommendations to grow your business. Dedupes like a charm without a single error! Putler is better than evrything else! Putler cuts down all the back and forth of checking WooCommerce stats, tallying with payment gateways, accurate subscriptions stats, time zone adjustments, refunds and what not. There were some hiccups initially, but Putler team solved them quickly. I struggled to get accurate reporting in WooCommerce – checking stats in WooCommerce and tallying with my payment gateways. Factoring in time zone adjustments, refunds and what not. After discovering Putler I connected both my WooCommerce store as well as PayPal account to it. And what took me three tiresome hours every week was available instantly in Putler. Sign-Up for Putler or go to My Account and enter credentials. Go to Profile > Settings > Integrations > Link a new integration. Select WooCommerce under E-commerce category. Fill in your WooCommerce shop URL. Click ‘Install plugin’ if you have not installed WooCommerce – Putler connector plugin on your WooCommerce site. If you have already installed and activated WooCommerce – Putler connector plugin then click ‘I’ve installed Plugin’ button. Putler is the perfect companion for anyone selling online using WooCommerce. It will provide you instantly useful and breakthrough insights on all aspects of your business- subscriptions, products, customers and more.